As a previous post here covered, Dungeons & Dragons was the first game to make practical use of all five Platonic solids as dice. The first printing of Dungeons & Dragons (1974) did not, however, employ the classic abbreviations of dice notation: d4, d6, d8, d12 and d20. Instead, we see constructions like, "From 2-16 snakes can be conjured (roll two eight-sided dice)." 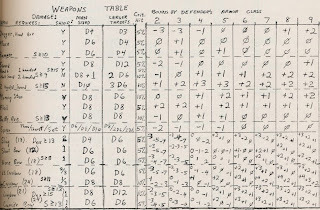 Initially, TSR had no need for dice notation, instead favoring number ranges which assumed players could infer the dice needed: this was the convention through the Holmes Basic Set (1977), which is full of systems of the form, "Damage: 3-24 points." These same conventions prescribe dice throws in the contemporary Monster Manual. 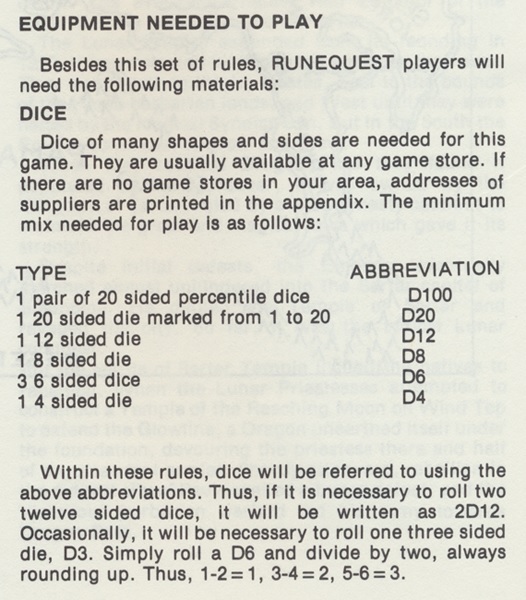 The Players Handbook (1978), however, suddenly makes liberal use of dice notation, without any preamble, as if players were expected to recognize a "d20," and more significantly, qualifiers like "5d20." 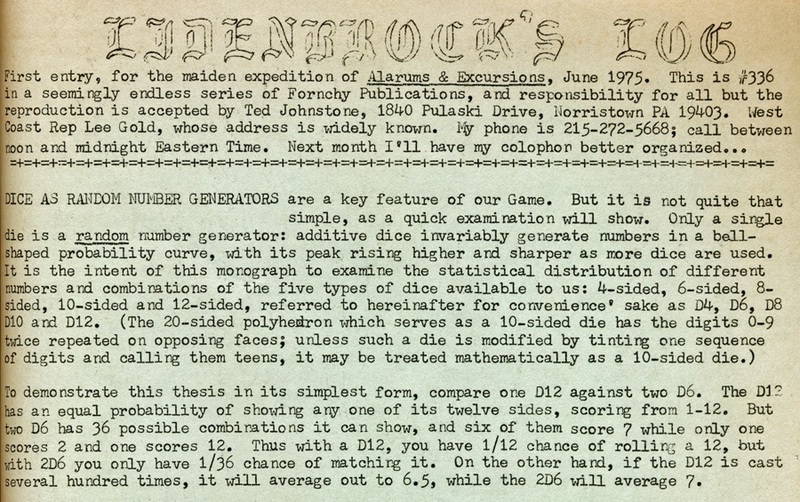 This strongly hints that dice notation had been in use long before TSR embraced it, and we can in fact trace its origins to the very dawn of D&D fandom: as we see above in Alarums & Excursions #1, in an article by Ted Johnstone on "Dice as Random Number Generators." Alarums #1 ranks among the very earliest D&D fan publications, and it is clear from Johnstone's tone that dice notation was not yet an established convention. After describing each of the dice in turn, he proposes that they be "referred to hereafter for convenience's sake as D4, D6, D8, D10 and D12." Since Johnstone intends to discuss the bell curves associated with multiple dice, he further introduces a qualifying number before the "D", in constructions like, "with a D12, you have 1/12 chance of rolling a 12, but with 2D6 you only have 1/36 chance of matching it." Throughout the article, he uses this compound construction to discuss the properties of "12D6," "2D4" and so on. Gold's syntax explicitly refers to the "D20" instead of the "D10," and also introduces the abbreviation "%ile" for what later notations would call the "D100." While the "%ile" abbreviation saw little uptake, the "D20" had considerable staying power. This could serve nicely as the description of dice notation that the Players Handbook conspicuously lacked, at least until the Dungeon Masters Guide (1979) gave a lengthier account of dice and notation. Certainly TSR was aware of All the Worlds' Monsters, and Runequest narrowly beat the Players Handbook to the market. But more significantly, Gary Gygax had long been a contributor to Alarums, and certainly read Johnstone's article in Alarums #1, given his response in the second issue. The dice notation in the Players Handbook does differ in subtle respects from the earlier fan systems: for example, it uses a lower case "d" instead of an upper case "D," so one rolls "2d6" instead of "2D6." The Players Handbook also prefers to spell out "percentile" rather than abbreviating it (later, the DMG would sporadically use "d%"). It is however clear that TSR chose to embrace a longstanding practice when it added this notation to the game of Dungeons & Dragons in 1978: one so familiar and intuitive that no special explanation of the notation was warranted. 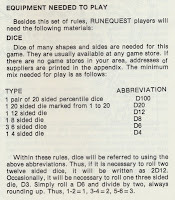 While the precise abbreviations for the names of dice may seem a matter of slight historical import, eventually the abbreviation for an icosahedron would become practically synonymous with the game of Dungeons & Dragons, as the d20 System (2000) became the basis for Wizards of the Coast's third edition of Dungeons & Dragons and many dependent games. Studying the origins of dice notation moreover gives us another window into the way that TSR accepted the contributions of fans and addressed competing ideas in the marketplace. 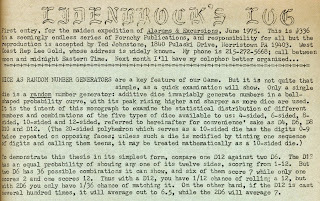 [*] Before the Players Handbook, there were only sporadic and fragmentary references to dice notation in TSR publications, and these only in contributions to its periodicals. 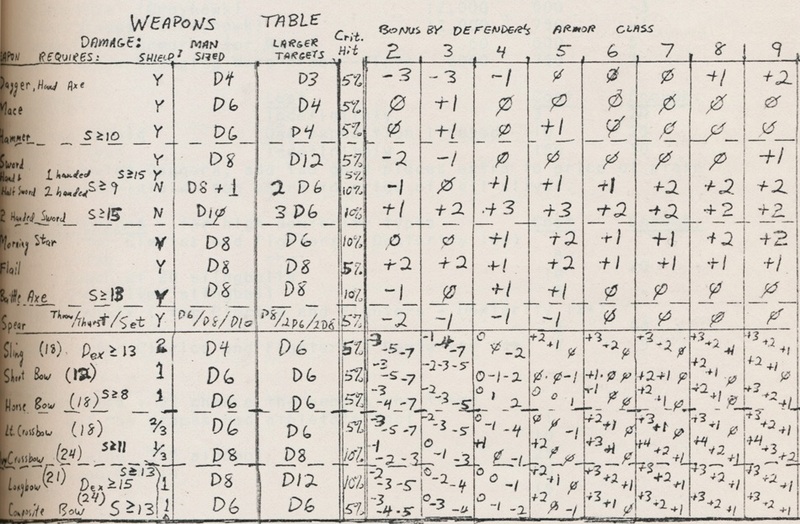 An article by Omar Kwalish for the June 1977 issue of the Dragon copies the percentile derivation table from Fight in the Skies, but gives it the title "Percentages Generated with Two Standard Dice (D6)." In February 1978, Rob Kuntz's first article on the Cthulhu mythos (a first draft of the material later to be famously redacted from Deities & Demigods) describes how Cthuga, Lord of Fire, "may summon up to 8 12 hit die (8 d12) fire elementals." These sorts of casual mentions only further illustrate how widespread dice notation had become without TSR's explicit endorsement. Omar Kwalish => Tim Kask, writing articles when they needed fill-in material. I started with the white boxed set - and we had very little idea how it all worked. Luckily the rules were so brief there was room to just add in house versions when you didn't understand something. For instance, nowhere could we find any reference explicitly stating whether an attack using a bow was the same as a regular attack, so we had some house rule involving a d6 to determine a hit when we shot a bow. The original d20s had no color on the numbers (which were just 1-10 twice), they were just etched into the surface, so we would take a colored pen and color in half in one color and half in the other to make a d20. You would role your d20 and say "blue high" or something like that. "Thus "2d4" would mean that two 4-sided dice would be thrown (or one 4-sided would be thrown twice); "3d12" would indicate that three 12-sided dice are used, and so on". I believe the only place this notation is actually used in the revised rulebook is on the Reference Tables sheet, which uses 1d20 twice and 2d6 once. But the 1st print of B2 also came out around the same time and makes sporadic use of it, mostly for treasures (d6 coins, etc). Just found my 2nd edition Holmes (Nov 78), and the same language is in there. And the module B1 from the same month has examples of the "d20" notation as well. This is just a few months after the Players' Handbook came out in Jun 78. We used to play a little game during slow moments around the D&D table (like when the DM was looking up a rule or generating treasure). Someone would yell out a number range ("7-34"), and the winner was the first person who could come up with a way to generate that range with dice (3d10+4). They could get convoluted (e.g., 1-26 = 2d8 + 1d12 -2).